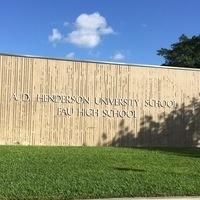 Alexander D. Henderson University School (ADHUS) is a cluster of buildings located off Florida Atlantic Boulevard. The main parking lot for ADHUS is Lot 26. ADHUS is a public school functioning as a laboratory school located on the campus of FAU in Boca Raton. It serves as a site for student field experiences and provides an excellent opportunity for teacher trainees to work with highly qualified master teachers in a model school environment.